Took this ages ago but never got around looking at it carefully. 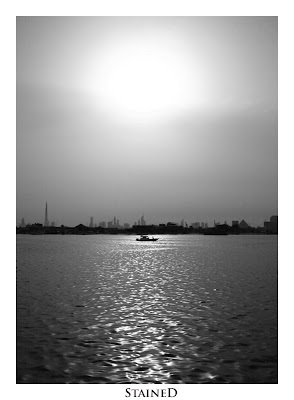 Was taken during the Dragon Boat Race at Festival City. Black & White conversion was done to the shot in Photoshop. 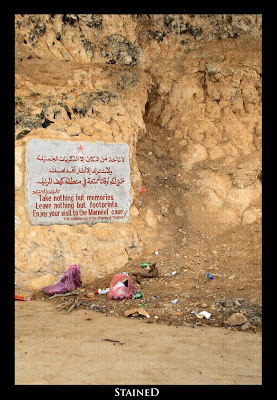 1) As we headed off from Al Mughsayl Bay Beach we stopped beside the road to look at the view beneath. 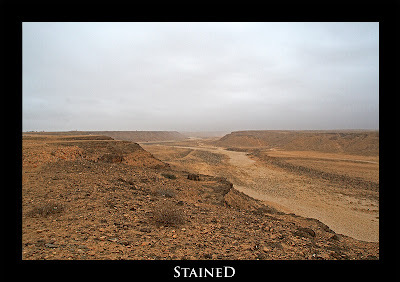 2) It seemed like a dried up wadi/valley/river by the looks of it. 3) The camels returning to the houses (pictured above) as the sun sets. There were atleast a 100 of them coming from every direction making their way to their respective camps. 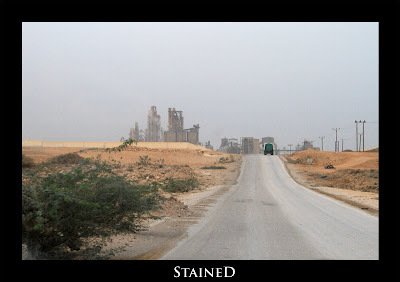 4) We headed off into the industrial area of Salalah in the hopes of finding another Frankincense trail but got lost. 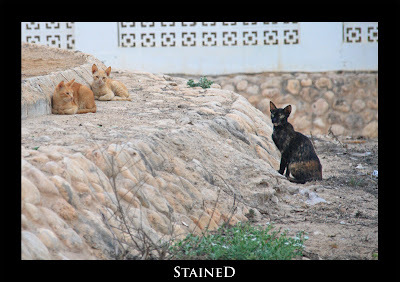 5) We spotted these cats next to a Bird Sanctuary that was located next to what seemed like an up scale neighbourhood of Salalah with mansion-like houses. 6) The next day we roamed around within the city a bit. Did a little last minute shopping at the Heritage Village where they were also showcasing different types of guns. 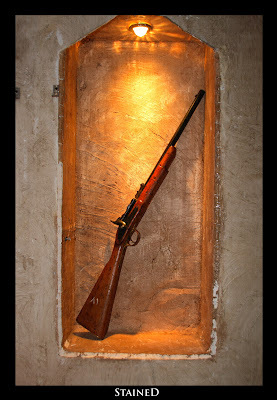 Some of the rifles were loooooooooooong!!!! 7) Chicken on the rocks. 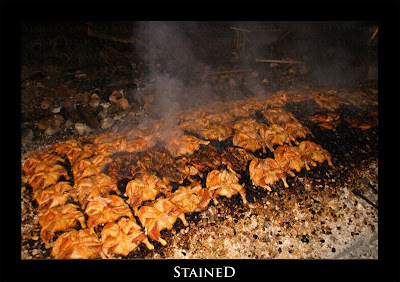 Basically chicken that is cooked on hot stone though we didn't try it. We preferred having the delicious chicken we'd already had earlier rather than try something new. 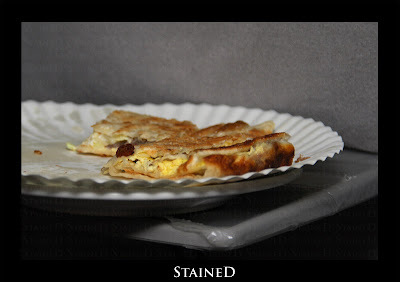 8) These rotis available at some of the road side restaurants are DELICIOUS!! 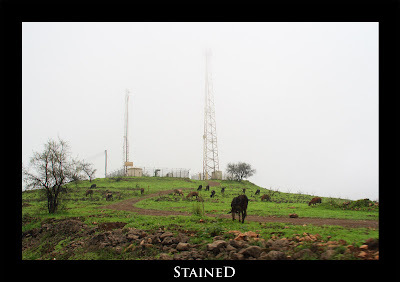 A must have in Salalah. 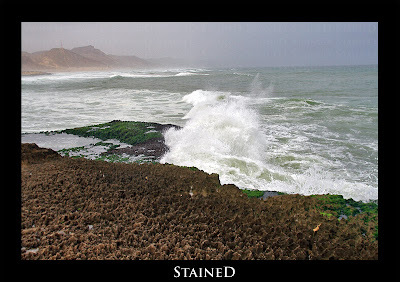 9) We left Salalah early in the morning in the hopes of getting back home by Thursday early morning while having dinner in Muscat. 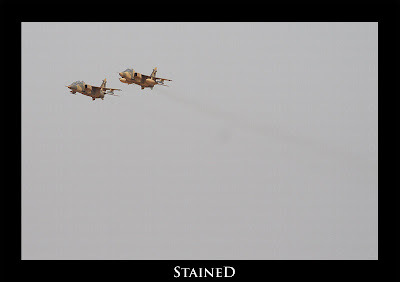 10) We saw these jets fly past us as we left the town of Thumrayt. It's quite common to see army vehicles on the road. 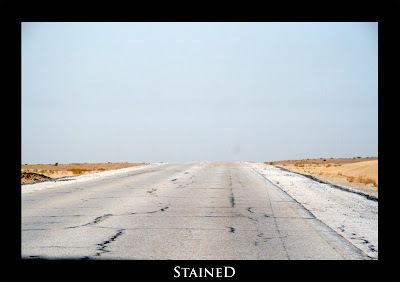 11) Several kilometres of the highway is made up of roads that are old and breaking apart. They are in the process of building a new road but 1000 kilometres of construction doesn't come cheap and will take a few more years easily. So you need to be very careful while driving and one hand driving needs to be completely avoided though we were still zooming at 120kmph+ and getting overtaken by lunatics. 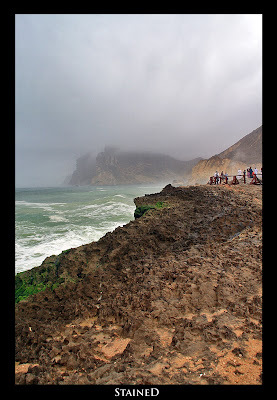 12) Luckily the trip from Salalah to Muscat was not as hot as we expected. It was cloudy most of the time and cooler than we thought. The temperature reached a peak of just 36'C even when the sun was blazing away. Imagine that in Dubai in August. 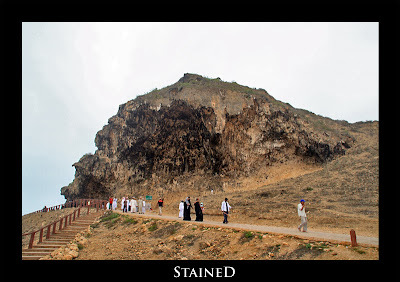 13) We had left at 8am from Salalah and after 12 hours of almost continuous driving we reached Muscat at approximately 8pm. I drove for about 3 hours and freaked myself out a few times. Basically it was a windy day and the car kept moving left and right. Now our car isn't a light one, it is a heavy 4wd but the small movements that were created by the wind added to the fact that we were travelling at 140kmph (I got to drive only on the section where the road was new and smooth) was scary. It wasn't a constant one side movement..one second the car is drifting right and then the next second a whiff comes and pushes the car towards the left. Being inexperienced in such situations, I didn't know how fast to react. Anyway while we made our way to Muscat, covering approximately 1000+ kilometres, I hadn't visited the toilet the whole trip (I know I'm spoiled). Our plan was to have dinner at the Omar Al Khayyam restaurant in Muscat since we had loved the food and atmosphere there when we were in Muscat 5-6 years back. I was hoping Muscat (unlike Salalah) would have proper toilets. Luckily the Centrepoint (Splash, Baby Shop etc) there next to the restaurant had one and I was relieved. 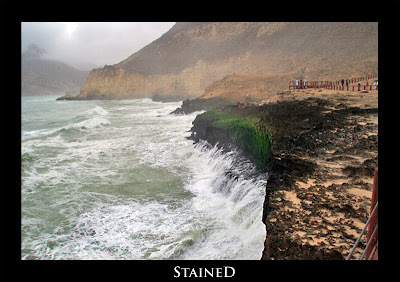 The temperature in Muscat City was a cool 28'C in August (*shock*). 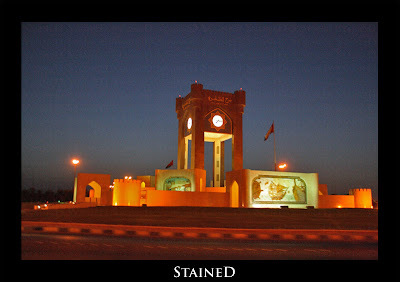 This is a shot of the Muscat Clock Tower. 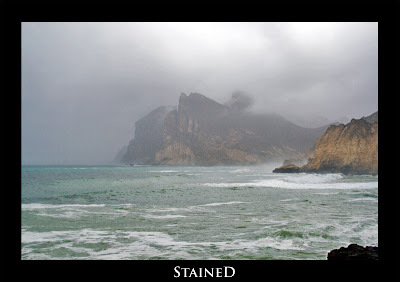 We left Muscat (changed a lot since the last time we were there) at about 10pm. Made our way to Hatta via Sohar. Saw a few brightly lit (using enough power to light up a small Indian town) Lulu hypermarkets. We got to the border by 1am. Went through the usual border check procedure. I haven't got any pictures cause I was half asleep though as soon as we entered UAE, me (and the rest of the family) were all wide awake. It felt nice to be back home (even though we were still a few hours away from our actual home). The temperature was still around 30'C. As we drove, the distance got shorter but the temperature kept increasing. We got back home at 3am by which the temperature had increased to 40'C (at night, sheesh!!!). Even though I should have been tired and sleepy after the long trip, I didn't feel that way. I carried all the luggage up, unpacked a few stuff, cuddled up with my cats (I missed them sooo much) and did a few other chores. It was 4:30ish by the time I slept. I think I woke up the next day at 12pm. 1) Al Marnif cave. I was expecting a real proper uncharted cave but like every other cave marked on the map it was kinda disappointing. This place was a huge tourist (local and international) attraction with at least a thousand people lingering around it. It's known for its blow holes (pictured later). 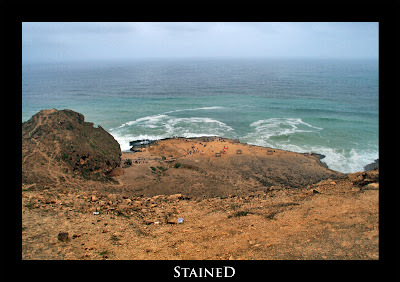 On speaking to a friend who had gone to Salalah last year, she remembers this area as a deserted tourist spot. 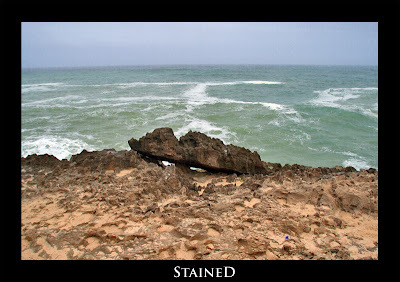 But that was one rare situation as people were advised to stay away from the coast due to Cyclone Gonu. My friend hadn't heard about the warnings so hadn't bothered staying away. I really wish I could have experienced something similar. Too many people is sometimes a pain!!! 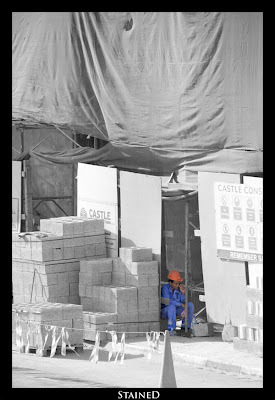 2) A boundary was erected around the whole area to prevent people from plunging to a not so painful death (hopefully). 3) A view of the area around the blow holes and the scenic background. This was taken as we made our way down from the cave to the blow holes. 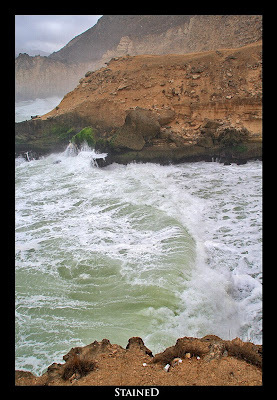 4) Water draining off the cliffs after a wave crashed into it. 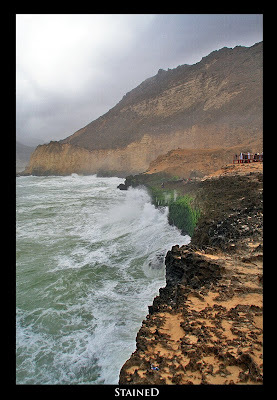 5) A wave crashing into the rocks. 6) View of Al Marnif cave from the other side. 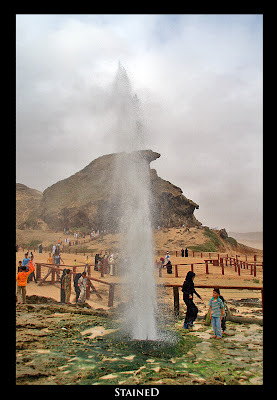 7) One of the Blowholes. Bascially the sea water crashes into the cliff, flows into caves beneath and gushes out from holes in the ground. It was fun dodging them. I think the caves beneath were the real caves though it was close to impossible to go there. 8) I took this one cause to me it seemed like the rock was perfectly balanced on the edge though I doubt if it really was on the edge... though it does seem like that from this angle. 9) I just love the way that mountain looks. 10) Wave crashes against the cliff. Next to the green patch on the rock lies a cave that you can't see but it was quite obvious one existed. Basically after ever wave crashed into the cliff, water used to flow off the cliff. Near the green patch, water flowing out would go on for a much longer time in comparison . 11) The force created by the waves bouncing back off the cliff created its own flow of movement back towards the sea making the water near the cliff shallow. 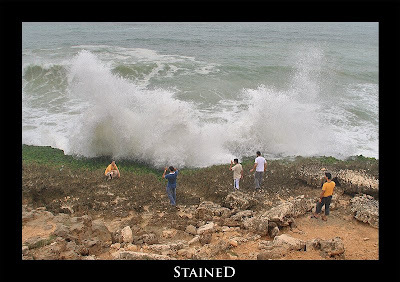 So basically after every wave, the water near the cliff was shallower in comparison to the rest of the sea. Something I have surely not seen here. Also evident from this picture is what I stated earlier about the existence of a cave. 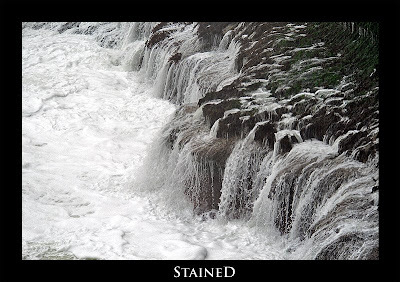 As you can see the amount of water flowing out at the lower part of the picture is much more in comparison. That is where the cave is. 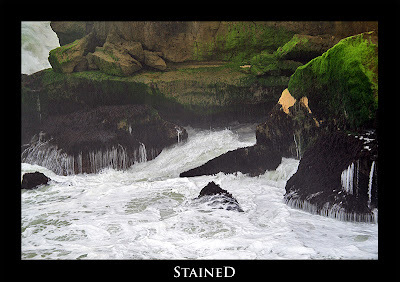 12) Water draining off the cliffs after a wave crashed into it. 13) There was a huge 'U' in the cliff further ahead. 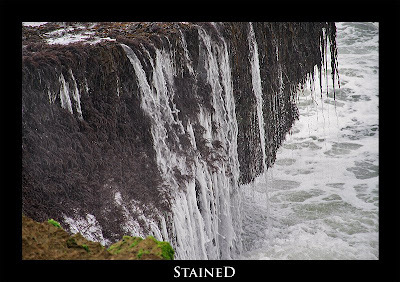 Watching the water flow past us was pretty cool as you watch the wave lose its power as the water gets shallower. 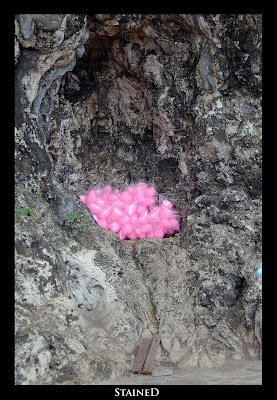 14) Not really a cave but I'll still call it one. 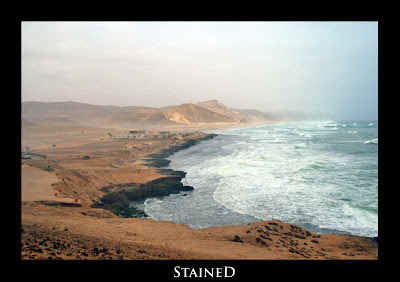 17) View of the Al Mughsayl Bay Beach. 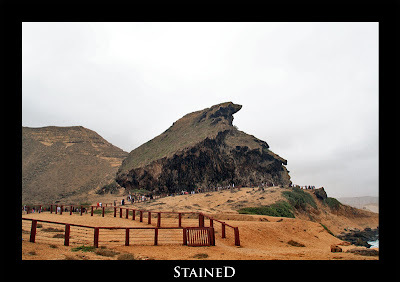 18) A view of the mountain (picture in #9) from the above. 19) Bird eye view of the Al Marnif Cave and the blow holes. 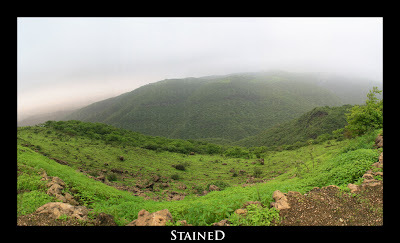 1) We headed north out of Salalah through the mountains to the hotter side to make our way to Wadi Dawkah where we were hoping to find the famous Frankincense trees used to make Oud. Seems like due to the high profit and demand of Oud, Frankincense trees seem to be scarce now so the government has launched a program to maintain its population in Oman. 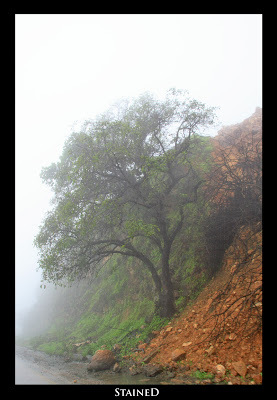 Wadi Dawkah is one such place where the trees have been planted and fenced off to keep them safe from human contact. 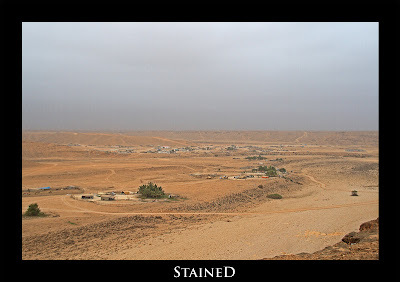 2) A panorama shot of Wadi Dawkah and the surrounding area. You can also see the monsoon clouds hanging over the mountains in the horizon. 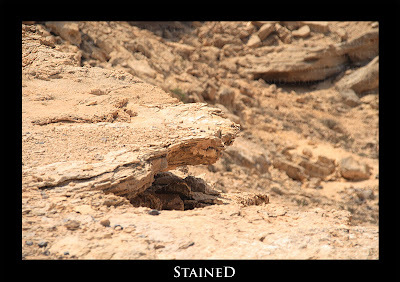 3) Picture of a stone formation near Wadi Dawkah. 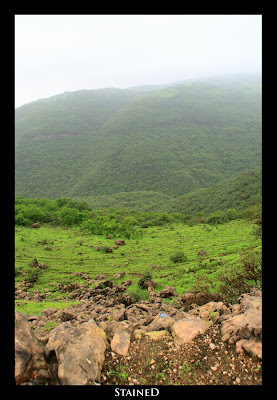 4) After being disappointed with the fact that we couldn't get close to the trees, we headed back into Salalah. As usual we passed a lot of greenery as we made our way through the mountains. We also spotted two huge herds of cows grazing around. 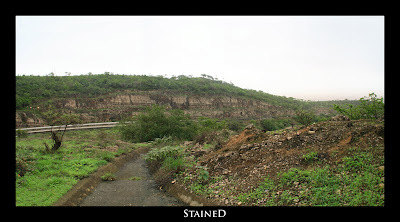 5) A panorama shot of the view from the side of the road. 6) Tree next to the road shot. 7) Another panorama shot of the view from the road. 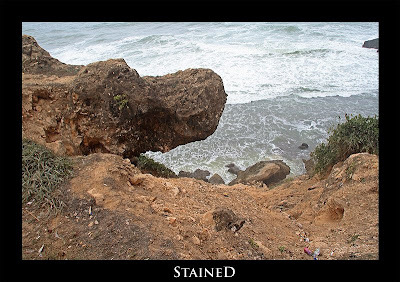 8) I took this picture while standing a few feet away from the edge. The view was just WOW!!! 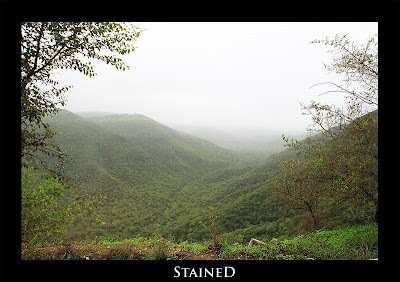 9) A panorama shot of the greenery below. 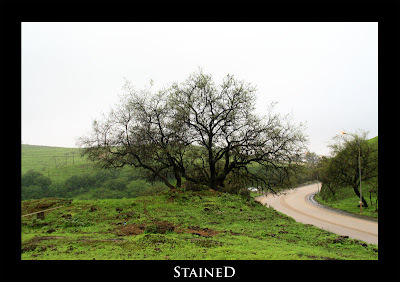 10) A panorama shot of the road and some greenery. 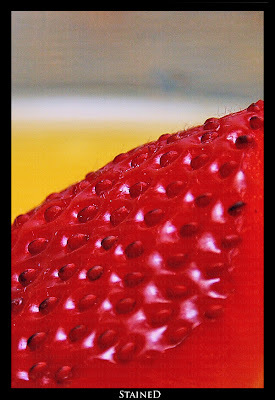 Notice that brownish smooth area on the lower left side of the picture. Basically it's for the water to flow off the road. I was standing on it and it was very slippery. I kept thinking that if I do end up slipping, I would be dead cause there was no way I could have stopped myself from going down the slope. 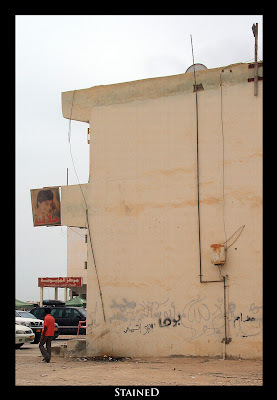 12) The building opposite where we were staying had a water heater on the outside. Weird!!! 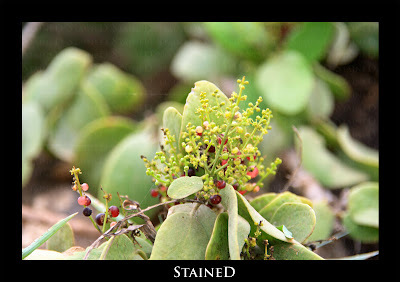 14) A shot of the fruits on the plant growing near Al Marnif Cave.